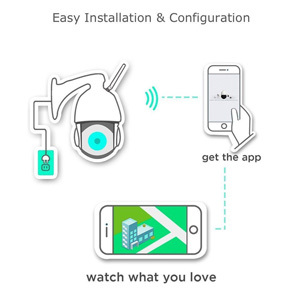 【1080P Intelligent Pan/Tilt/Zoom】- Ctronics PTZ Camera support 355° Horizontal Pan & 120° Vertical Tilt & 4X optical zoom , allows you to get closer to your target and watch every corner of your home. 【Real-Time Motion Detection】- Automatically record on SD card when this WiFi security camera detected any movements. External Sd card slot enables easy installation of the SD card without opening the camera. (No SD card pre-installed). 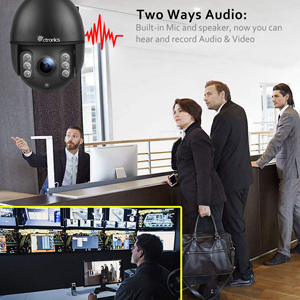 【Two way Audio& Night Vision】- Built-in Microphone and speaker in the IP camera, just feel free to greet guests or scare off intruders while you are not home. 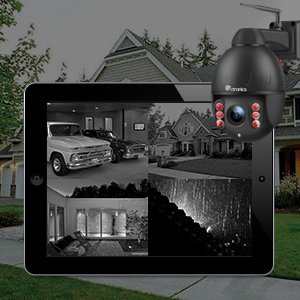 Enhanced night vision with 6pcs IR led lights, ranges up to 165feet even in dim environment. 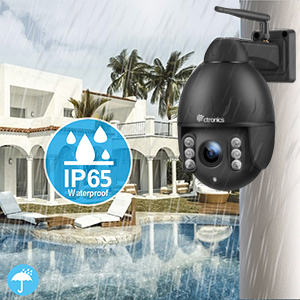 【IP65 Dust and Water-resistant】- Whether it's rain or shine, our outdoor camera meets the IP65 standard of against water and dust exposure, allowing this product to be used in indoor and outdoor monitoring , such as room. 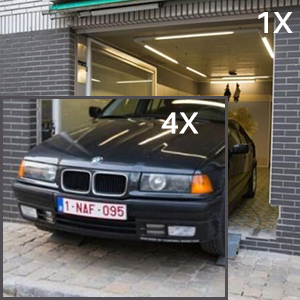 garage and backyard etc. 【Instant push alerts & Remote Viewing】- Get notified with real-time notification or email alerts when motion detected. Remotely check your home status and never miss any details no matter where you are. Ctronics 1080P outdoor security WiFi camera - Easy to install, perfect choice for home/office security. 24/7 watches and protects your families, pets, guests, ect from anywhere at any time. Warm Tips: Ctronics camera does not work with 5GHz band wifi, please make sure your smartphone and camera are connecting to the same 2.4GHz band wifi. When you are outside or at home, it will send alert notifications to your phone once detected any movement in the monitoring area to keep your home safe. No matter where you are, the security camera will be a reliable protector for your home and let you be assured. With high performance IR LED, this security camera provides up to 165feet clear night vision for 24-hour monitoring to check your family dynamics and office dynamics. When it detects brightness, the security camera can auto turns on night mode and monitoring. Built-in invisible speaker and microphone, this camera allows you to have stable conversations through the APP, you are enable to listen and talk with your families members, guests or scare off intruders when you are not home. Real Plug and Play and easy wifi set-up allows you to access the live feed in few minutes. Feel free to access your camera on mobile device (iOS or Android), Tablet or PC for remote controlling and viewing at anytime, anywhere.